Balsam Range is: Buddy Melton (fiddle, lead and tenor vocals), Darren Nicholson (mandolin, octave mandolin, lead vocals, baritone and low tenor vocals), Dr. Marc Pruett (banjo), Tim Surrett (bass, dobro, baritone and lead vocals), and Caleb Smith (guitar, lead & baritone vocals). The five original members are all acoustic musicians and singers from western North Carolina. They thoughtfully and respectfully adopted the name of a majestic range of mountains that surround part of their home county of Haywood, NC where the Great Smoky Mountains meet the Blue Ridge, the Balsam Range. The group’s ascent to the top of the Bluegrass world has left a well-marked trail of success since the band’s inception in 2007. One of the genre’s most award-winning artists in recent years, they have garnered eighteen International Bluegrass Music Association (IBMA) Awards on the heels of seven critically acclaimed albums. 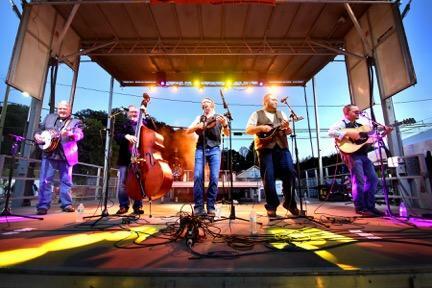 Indeed, in 2017 Balsam Range garnered eight nominations from the International Bluegrass Music, more than any other artist save the Earls of Leicester (who appeared at the 2017 edition of the Muncie Three Trails Music Series). Balsam Range won the award for Bluegrass Album of the Year (Mountain Voodoo) and also garnered nominations for Entertainer of the Year, Song of the Year, Gospel Performance of the Year, Vocal Group of the Year, and Instrumental Group of the Year, as well as individual nominations for Male Vocalist (Buddy Melton) and Bass Player (Tim Surrett). Balsam Range has left audiences spellbound while headlining major festivals from coast to coast, selling out venues across the nation, and appearing multiple times at the Grand Ole Opry. On their newest release, Mountain Voodoo, the quintet cleverly captures traditional yet contemporary sounds. There are fiery instrumental parts alternating with deep heavy ballads, overlaid by the vocal harmonies the group has become known for. Debuting at number four, Mountain Voodoo remained on the Billboard chart for nineteen weeks. The first single, “Blue Collar Dreams,” spent 3 consecutive months at the number one spot on the Bluegrass Today Charts.